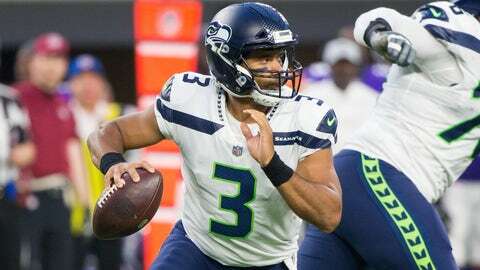 RENTON, Wash. (AP) — For most of his career, the fourth quarter is where Russell Wilson has thrived. His late game heroics of leading comebacks in the fourth quarter or overtime to win games take up nearly an entire page of Seattle’s weekly game notes. Except this year, when the fourth-quarter mistakes by Wilson have overshadowed his late-game successes. And those mistakes are part of the reason Seattle is 4-5 and faces such a critical game on Thursday night against Green Bay in the quest to stay in the NFC playoff conversation. Seattle is 1-8 in its last nine games decided by one score or less. Over the past two seasons, Seattle is 5-11 in one-score games. They used to be the types of games in which Seattle thrived, with Wilson finding a way to score and pull out a victory in the closing minutes, or defensively making the necessary stops to stem any late rally by an opponent. But that page in Seattle’s game notes detailing his 24 comebacks in the fourth quarter and overtime has just three entries over the past two seasons. There’s no doubting that in stretches this season Wilson has played great. He’s thrown for 14 touchdowns with just two interceptions over the past five games. And the success or failure of Seattle in the fourth quarter is not solely his responsibility. But there’s also been a pattern of crucial late-game mistakes by Wilson that has been a contributing factor to each of Seattle’s five losses. — In a Week 1 loss at Denver, Seattle gained seven yards on its final three drives and Wilson threw an interception on a desperation throw on the final play of a 27-24 loss. — In Week 5 against the Rams, Wilson missed on his final two passes with Seattle closing in on field goal range while down by two points with less than 4 minutes left. Seattle punted and never got the ball back in a 33-31 loss. — In Week 9, Wilson threw his second fourth-quarter interception that was returned for a touchdown when Desmond King stepped in front of a pass and the pick-six ended up being the deciding points in the Chargers’ 25-17 win. — And last week, Wilson was stripped by Dante Fowler midway through the fourth quarter deep in Seattle’s end. Brandin Cooks’ TD run on the next play ended up being the deciding points in the Rams’ 36-31 win. The only one-score game the Seahawks have won this season was arguably one of its uglier performances when Sebastian Janikowski kicked a 52-yard field goal on the final play to beat Arizona in Week 4. And while several of those games have seen Wilson rebound from his mistakes to give Seattle a chance in the closing seconds, the final results are not what the Seahawks have come to expect. NOTES: LB K.J. Wright (knee) was the only player not to participate in practice on Tuesday. Wright’s knee caused him to leave Sunday’s loss to the Rams early. … G D.J. Fluker (calf) and RB Chris Carson (hip) were full participants, strengthening Seattle’s belief the pair will play after missing last week’s game.